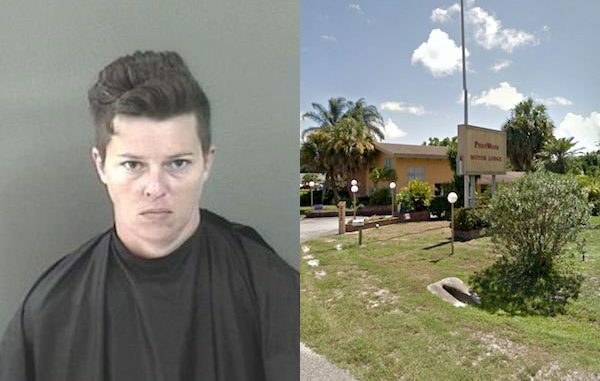 Deputies arrest a woman on a charge of Battery Domestic Violence in Sebastian, Florida. SEBASTIAN – A motorist called the Indian River County Sheriff’s Office after he saw two women in a physical fight on U.S. Highway 1 near the Pennwood Motor Lodge, according to the report. The motorist told deputies that he saw one woman holding the other by the hair and hitting her repeatedly in the head, the report said. Another witness who was traveling on U.S. Highway 1 in Sebastian observed the two women in a physical fight, with one “waling” on the other, according to the affidavit. The two witnesses identified 34-year-old Nicole Alison Giordano as the person striking the other woman repeatedly while holding on to her hair, the arrest affidavit said. “According to two independent witnesses, they each observed Giordano hitting [the victim] in a violent manner,” the deputy said. The victim told deputies that she has been in a relationship with Giordano for a number of years. However, the victim and Giordano told law enforcement that they were “attempting to get up off of the ground after they fell” and that no physical altercation occurred, according to the report. The deputy observed slight redness on Giordano’s hands including her knuckles. Additionally, the victim’s eyeglasses were found lying on the ground on the side of U.S. Highway 1. Giordano, of Sebastian, was arrested and charged with Battery Domestic Violence and transported to the Indian River County Jail.